The Road (2006), in many ways, bucks many expectations one might have about post-apocalyptic literature. I think that can be considered true of the rest of author Cormac McCarthy’s works. He is a writer who firmly grounds most of his works in genre fiction. Blood Meridian (1985) is a western novel. Child of God (1973) is a serial killer novel. Suttree (1979) is a southern gothic novel. But all of his works established in firm genre boundaries continue to explode notions readers may have of those genres. Blood Meridian is a western novel, but in many ways is the antithesis of the classic western as seen in novels like Owen Wister’s The Virginian (1902). It is unrelentingly violent and barbaric, and there is no notion of a battle of good and evil. 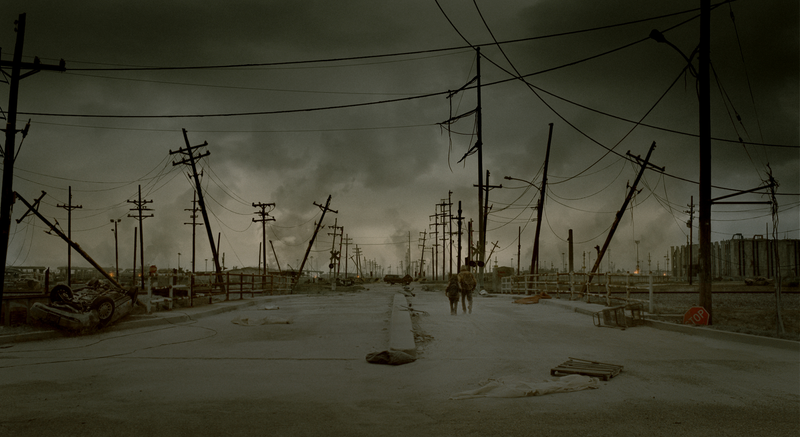 The Road also explodes the notion of post-apocalyptic literature. Whereas novels such as The Stand (1978) by Stephen King and The Day of the Triffids (1951) by John Wyndham focus on what comes after the fall of society, and how one could possibly reconstitute a society, McCarthy’s work has no interest in that at all. At its core, The Road is simply about the relationships between fathers and sons, and the ways sons idolize their fathers into being heroes they may not be, and how those notions of heroism conflict with reality. In fact, this central theme doesn’t really need the post-apocalyptic genre for it to be a great novel, but the added sense of desolation, horror and the will to survive accelerate these notions and put them in stark contrast with the unrelenting darkness that the two main characters are surrounded by. It is without a doubt this element of the novel that I most enjoyed, and that I got the most emotional response to. I had a deep, human, guttural response to this work that I simply never had with Blood Meridian. Author Cormac McCarthy’s novel explodes many of the notions readers may have about post-apocalyptic fiction. As for the post-apocalyptic setting, McCarthy conjures up a world entirely his own. It is a world in which nothing grows because nothing can take root in the soil. It is a world in which what is left of humankind struggles to survive on what has been left behind. It is a world in which humankind has turned on itself, and use each other for food. It is unrelentingly dark and a world full of horror and despair. There are moments in the novel which are genuinely sickening and terrifying. The most memorable and shocking of moments for me had to be when the man and the boy come across a seemingly empty house. They find several mattresses and a pile of clothes within. Then they find a basement filled with a dozen starving naked men, women and children. And one man with a leg missing. As the owners of the house arrive, the readers cannot help but connect the dots. The basement is a pantry, and these people are the livestock on which the homeowners are living on. McCarthy never points this out deliberately. He leaves the image there to gather in the mind of the reader, and when the pieces finally click the horror is all the more terrifying. The Road is without a doubt one of the most engrossing, absorbing, and emotional post-apocalyptic novels you’ll read. Whilst I hesitate to consider The Road as a literary classic like McCarthy’s own Blood Meridian, I will consent that an argument can be made. Ultimately, only time will tell whether The Road has the staying power that Blood Meridian does. It is very much a novel of the times. In a world in which 9/11 and the Paris Attacks can happen, it is very easy to slip into the worn and wearied shoes of the man and the boy and live in a state of constant fear. However, whilst the novel is depressing and bleak, these characters “carry the fire.” And whilst society probably won’t be able to reconstitute itself within the realms of the novel, it is some small comfort to know that human kindness and compassion can survive the most apocalyptic of environments.